Another great show behind us for the 2017-2018 season. The boys just returned home from the STLA Spring Longhorn Show in Rockdale, Tx. This show all three of the boys got in on the action. Levi entered the ring for his first time competing in the Pewee Class. He was helped by a very special lady that shows for the NASA Show Team, Zaida Espinosa. On Sunday, Levi was again helped by another young lady, Hannah Smith, from the Leander Show Team. Thank you very much ladies for Helping Levi have a great experience for his first time showing! Both Joseph and Levi won championships twice in their Pewee Classes over the two days. Christian and DBS Chewbaca did great as always racking up a 2nd and 5th place finish and a 3rd in Showmanship in the two days. DBS Tari Misu Rio made her second showing in the ring with a 9th out of 15, not bad considering she was the youngest in class and beat 6 calves that were 2 months older than her! The 2017-2018 Show Season contiues to be a good one for the Stahl Boys and show calves of DBS Longhorns. 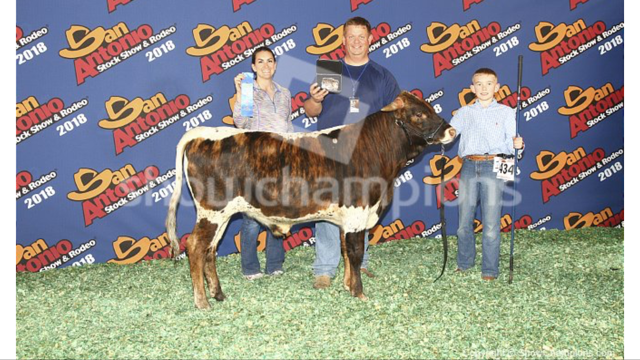 At San Antonio DBS Chewbaca made a strong showing in his class winning 1st and Youth Reserve Champion Steer. Christian is very proud of his first BUCKLE! Joseph received a first place in Pewee Showmanship with Chewey. Chaparral Piper made her return to the show ring in San Antonio, as well as DBS Tari Misu Rio made her debut into the ring! The 2017-2018 Show Season has started with a bang. 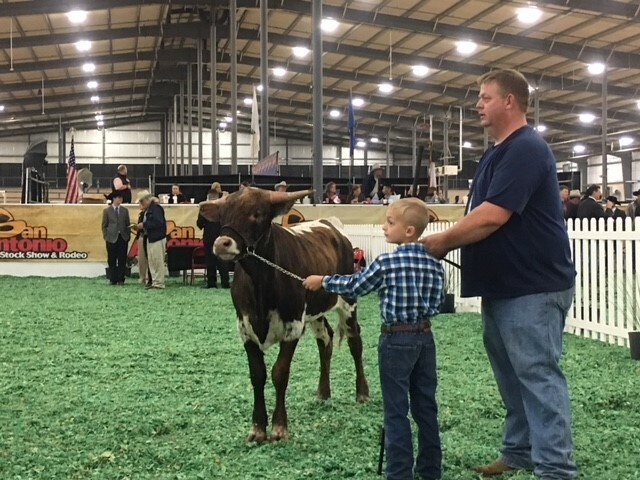 Both Christian and Joseph went into the ring with their steer DBS Chewbaca at the STLA Winterfest Weekend. They walked away two 1st places, Junior Reserve Grand Champion, and two 1st places in Pewee Showmanship! Great start to the season boys! The 2016-2017 Show Season was our first year for our son Christian to show calves. In his first season he was able to rack up a few awards with 2nd place in Showmanship at the San Antonio Stock Show and Rodeo. Christian concluded his 2016-17 show season with the Sunrise Ranch Showmanship Camp hosted by John T. and Betty Baker.